Turn new challenges and everyday demands into cost-saving opportunities- with the flexible RICOH Aficio SP 5210SF multifunctional printer. The powerful system is specifically designed to simplify everyday general office tasks for midsize workgroups. Quickly access exceptional multifunction performance- to complete a wide range of projects faster with incredibly low cost-per-page. Ideal for busier workloads, it offers incredible speed, quality and intuitive controls to streamline workflow so you can manage your documents more efficiently. For Common Criteria Certification (CCC) use. Boost throughput with exceptional print speeds. 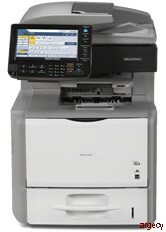 The SP 5210SF generates up to 52 pages per minute. Maximize convenience with paperless faxing. Super G3 faxing, Internet Fax, IP Fax, and LAN Fax support is standard on the SP 5210SF. Paper Sizes Standard Tray, Standard Sizes: Letter, Legal, Executive, Half Letter, A4, A5, A6, B5, B6, F/GL, Foolscap, Folio; Envelopes: Com10, Monarch, C6, C5, DL. Custom Sizes: Width: 3.86" - 8.5" (98 mm - 216 mm), Length: 5.52" - 14.01" (140 mm - 356 mm). Paper Weights Standard & Optional Tray(s): 14 - 59 lb. (52 - 220 g/m). When Duplexing: 16 - 44 lb.